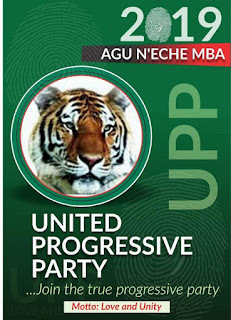 The United Progressive Party, UPP in Imo State has continued to grow in leaps and bounds, as frontline politicians in the State have continued to flock into the party. The latest entrants are Ugo Sly, a former PDP Owerri zone Senatorial aspirant who has joined the UPP and emerged the party's candidate for Owerri Senatorial zone. Also in the fray is a former Speaker of the Imo State House of Assembly. Rt Hon kelechi Nwagwu who has also joined the party. Nwagwu was formerly of the All Progressive Congress, APC and was a staunch member of the Coalition faction in the party. In Ezinihitte/Ahiazu Federal Constituency, the UPP ticket is up for grabs between Mr. Kemjika Ezeji and Okey Ihuoma. In a related development, the governorship candidate of the UPP, Hon Tony Nwulu has promised to constitute a Unity Government for Imo State if elected Governor. He said only a Unity Government will restore unity of the State which has been sharply polarized by divisive tendencies exhibited by the political elites for many years. He said the Unity Government will accommodate all shades of politicians and key stakeholders who share his vision for a new Imo where the economic development and prosperity of the State will be paramount. Nwulu also assured Imolites that only a UPP government will drive such a Government that will give Imolites a fresh air, assuring that his administration will aside giving Youths a major role will also tap the fountain of knowledge of the elders for the advancement of the State. He said the Unity Government will be all encompassing as all stakeholders in the State will be given the opportunity to aid his government to restore Imo State on the path of glory and economic prosperity. The Federal lawmaker who represents Oshodi/Isolo Federal Constituency and who initiated the Not Too Young To Run assured that he has outlined a comprehensive socio economic blueprint that will take Imo State away from the valley of despair to the fountain of prosperity and development.